Southward view; the Mid-Hudson Bridge is in the background. Poughkeepsie (), officially the City of Poughkeepsie, is a city in the state of New York, United States, which serves as the county seat of Dutchess County. Poughkeepsie is located in the Hudson Valley midway between New York City and Albany, and is part of the New York metropolitan area. The name derives from a word in the Wappinger language, roughly U-puku-ipi-sing, meaning "the reed-covered lodge by the little-water place," referring to a spring or stream feeding into the Hudson River south of the present downtown area. 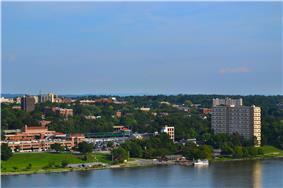 Poughkeepsie is known as "The Queen City of the Hudson". It was originally settled in the 17th century by the Dutch and became New York's second capital shortly after the American Revolution. It was chartered as a city in 1854. Major bridges in the city include the Poughkeepsie Bridge, a former railroad bridge now serving as a public walkway, which opened on October 3, 2009, and the Mid-Hudson Bridge, a major thoroughfare built in 1930 that carries U.S. Route 44 (concurrent with State Route 55) over the Hudson. The City of Poughkeepsie lies in New York's 18th congressional district. Main Mall Row, one of many Registered Historic Places in the city. Statue of Thomas Dongan (The 2nd Earl of Limerick from 1698) in Dongan Park in Poughkeepsie, unveiled in June 1930. The site of Poughkeepsie was purchased from Native Americans in 1686 by Robert Sanders, an Englishman, and Myndert Harmense Van Den Bogaerdt, a New Netherland-born Dutchman. The first settlers were the families of Barent Baltus Van Kleeck and Hendrick Jans van Oosterom. The settlement grew quickly, and the Reformed Church of Poughkeepsie was established by 1720. The community was set off from the Town of Poughkeepsie when it became an incorporated village in 27 March 1799. 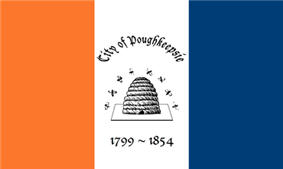 The City of Poughkeepsie was chartered on 28 March 1854. Outside of municipal designations, the City and Town of Poughkeepsie are generally viewed as a single place and are commonly referred to collectively as Poughkeepsie, with a current combined population of approximately 75,000. Spared from battle during the United States Constitution. With its ratification, New York entered the new union as the eleventh of the original thirteen colonies to join together as the United States of America. 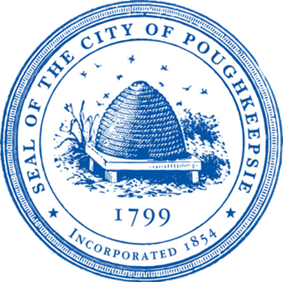 In 1799, a new seal was created for Poughkeepsie. Early on, Poughkeepsie was also a major center for whale rendering, and during the 19th century industry flourished through shipping, hatteries, paper mills, and several breweries along the Hudson River, including some owned by Matthew Vassar, founder of Vassar College. Due to the area’s natural beauty and proximity to New York City, families such as the Astors, Rogers, and Vanderbilts built palatial weekend homes nearby. The Vanderbilt mansion, located several miles up the Hudson from Poughkeepsie, is registered as a National Historic Site; it is considered to be a sterling example of the mansions built by American industrialists during the late 19th century. The city is also home to the oldest continuously operating entertainment venue in the state, the Bardavon 1869 Opera House (see below). View from the Walkway Over the Hudson. View of Poughkeepsie from the walkway. The City of Poughkeepsie is on the western edge of Dutchess County, bordered by the Hudson River on the west and by the Town of Poughkeepsie on the north, east and south. There are two crossings of the Hudson River in Poughkeepsie: the Mid-Hudson Bridge, which offers a crossing for motor vehicles and pedestrians, and the pedestrian Walkway Over the Hudson. According to the United States Census Bureau, the city has a total area of 5.7 sq mi (14.8 km2). 5.1 sq mi (13.3 km2) of it is land and 0.23 sq mi (0.6 km2) of it (9.65%) is water. It is about 70 miles (110 km) north of New York City and it is located in southeastern New York State. Poughkeepsie has a humid continental climate (Köppen Dfa) with relatively hot summers and cold winters. It receives approximately 44.12 inches (1,121 mm) of precipitation per year, much of which is delivered in the late spring and early summer. Due to its inland location, Poughkeepsie can be very cold during the winter, with temperatures dropping below zero a few times per year. Poughkeepsie can also be hit by powerful nor'easters, but usually receives significantly less snow from these storms compared to locations to the south and east. Source #2: Weatherbase (snowfall) "
As of the census of 2010, there were 32,736 people. The population density was 5,806.2 inhabitants per square mile (2,243.8/km²). There were 13,153 housing units at an average density of 2,556.6 per square mile (988.0/km²). The racial makeup of the city was 52.8% White, 35.7% Black or African American, 10.6% Hispanic or Latino of any race, 1.6% Asian, 0.4% Native American, 5.3% from other races, and 4.1% from two or more races. There were 12,014 households, out of which 28.3% had children under the age of 18 living with them, 29.8% were married couples living together, 19.7% had a female householder with no husband present, and 45.4% were non-families. 35.4% of all households were made up of individuals and 13.2% had someone living alone who was 65 years of age or older. The average household size was 2.40 and the average family size was 3.15. In the city, the population was spread out with 25.9% under the age of 18, 12.2% from 18 to 24, 29.2% from 25 to 44, 19.0% from 45 to 64, and 13.6% who were 65 years of age or older. The median age was 33 years. For every 100 females, there were 91.7 males. For every 100 females age 18 and over, there were 88.0 males. The median household income in the city was $29,389, and the median income for a family was $35,779. Males had a median income of $31,956 versus $25,711 for females. The per capita income for the city was $16,759. About 18.4% of families and 22.7% of the population were below the poverty line, including 30.3% of those under age 18 and 13.8% of those age 65 or over. Spackenkill Union Free School District, comprising generally the southern part of the Town of Poughkeepsie, consists of Hagan Elementary School, Nassau Elementary School, Orville A. Todd Middle School and Spackenkill High School. Two institutions of higher learning operate campuses within the city: Adelphi University's Hudson Valley Center and the Ridley-Lowell Business and Technical Institute. The Culinary Institute of America is located in the suburb of Hyde Park. Dutchess Community College, Marist College, and Vassar College are located in the suburb of the Town of Poughkeepsie. 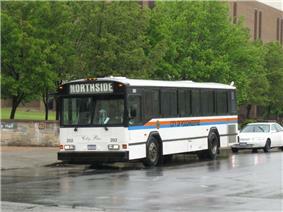 Local bus transit in the city of Poughkeepsie. Poughkeepsie sits at the junction of the north-south US 9 and east-west US 44 and NY 55 highways. Rail commuter service to New York City is provided at the Metro-North station by the MTA's Metro-North Railroad. Poughkeepsie is the northern terminus of Metro-North's Hudson Line. Amtrak also serves the station, along the Hudson River south to New York City's Pennsylvania Station and north along the river to Albany-Rensselaer station and points further north and west. Amtrak trains serving Poughkeepsie are the Adirondack, Empire Service, and Maple Leaf. Additionally, Amtrak's New York-Chicago train, the Lake Shore Limited, the successor to the fabled 20th Century Limited, serves this station when coming eastbound from Chicago. The Mid-Hudson Bridge, opened in 1930, carries US 44 and NY 55 across the Hudson River from Poughkeepsie to Highland. 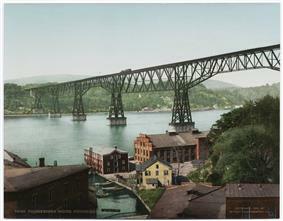 The Poughkeepsie Bridge opened in 1888 to carry railroad traffic across the Hudson, but all usage of the bridge came to an end when a 1974 fire damaged its decking. A local group (Walkway Over The Hudson) raised the funds to convert the bridge into a unique linear park connecting rail trails on both sides of the Hudson River. The walkway opened on October 3, 2009, coinciding with the 400th anniversary of Henry Hudson's first exploration of the river named for him. The bridge is now open for pedestrian and bicycle use and is a State Historic Park. The Dutchess County Airport in nearby Wappinger services general aviation, although it once had scheduled air carrier service by Colonial Airlines in the 1950s and regional airline service by Command Airways and others in the 1960s–1980s. The nearest major airport to Poughkeepsie is Stewart International Airport about 25 miles (40 km) south in Newburgh. Other nearby airports include Albany International Airport approximately 75 miles (121 km) north and the three major metropolitan airports for New York City: John F. Kennedy International Airport approximately 88 miles (142 km) south, Newark Liberty International Airport approximately 105 miles (169 km) south, and LaGuardia Airport approximately 80 miles (129 km) south. City of Poughkeepsie Transit, operated by the City, operates five mostly unidirectional loop routes throughout the city, town, and into Hyde Park. Dutchess County LOOP, operated by Dutchess County, travels throughout Dutchess County and also serves as the main link to the Route 9 corridor including Poughkeepsie Galleria and South Hills Mall. Both services have a quasi-hub at the intersection of Main and Market Streets, adjacent to the Mid-Hudson Civic Center and at the west end of the former pedestrian-only Main Mall (the Mall was removed in 2001, with those blocks being restored back to traffic and to the name Main Street). Other buses serving this area include Adirondack Trailways, ShortLine, commuter runs to White Plains, and a shuttle to New Paltz. The city is protected by the career firefighters of the City of Poughkeepsie Fire Department. By keeping buildings up to code, controlling illegal occupancies, monitoring the safety of living areas and issuing licenses and permits, the department works to control the potential for dangerous situations. The PFD operates out of three fire stations, located throughout the city, and operates and maintains a fire apparatus fleet of four engines, including one reserve engine; two trucks; one rescue vehicle, cross-staffed as needed; and one fireboat. The Arlington Fire District, Fairview Fire District, and New Hamburg Fire Department cover the Town of Poughkeepsie. The PFD is capable of handling fires, rescues, extractions and natural disasters. The PFD is a certified EMS first responder fire department and first respond to EMS calls with Mobile Life Support Services. Police protection to the city is provided by the City of Poughkeepsie Police Department. When someone calls 9-1-1 in the city, their call is routed to the city 911 headquarters. From there they notify police units in the city, and locate the closest available unit. The Dutchess County Sheriff Station is based in Poughkeepsie and is adjacent to the Dutchess County Jail, which houses around 275–300 inmates maximum capacity at any time. Emergency Medical Services are provided by Mobile Life Support Services (MLSS), who are contracted to provide full-time ambulance coverage to the City of Poughkeepsie. MLSS provides Paramedic (ALS) level service and have ambulances stationed in the city on Cottage Street. MLSS also has a staff of specially trained paramedics that provide Tactical EMS support to the city police during ESU/ SWAT operations, as well as emergency rehabilitation to city firefighters via their Special Operations Response Team. They also provide ALS ambulance service to multiple other agencies and municipalities in Dutchess, Ulster, and Orange Counties, and their headquarters building is located in New Windsor, NY. IBM has a large campus in Town of Poughkeepsie, once referred to as IBM's "Main Plant," although much of the workforce has been moved elsewhere in the company (2008). The site once built the IBM 700/7000 series of computers as well as the IBM 7030 Stretch computer and later IBM mainframes. The RS/6000 SP2 family of computers, which came to fame after one of them won a chess match against world chess master Garry Kasparov, were also manufactured by IBM Poughkeepsie. In October 2008, IBM's Poughkeepsie facility was named "Assembly Plant of the Year 2008" by the editors of Assembly Magazine. Poughkeepsie remains IBM's primary design and manufacturing center for its newest mainframes and high-end Power Architecture servers, and it is also one of IBM's major software development centers for z/OS and for other products. Until 1972, Poughkeepsie was home to the Smith Brothers cough drop factory. The Smith Brothers' grave site is in the Poughkeepsie Rural Cemetery. The Poughkeepsie Journal is the third-oldest active newspaper in the United States. FM radio stations in the area are WRRV-96.9 (alternative rock), WPDH-101.5 (album-oriented rock), WCZX-Mix 97.7 (adult contemporary), WKXP-94.3 The Wolf (Country), WRWD-FM-107.3 (country), WSPK-104.7 (top 40), WHUD-100.7 (adult contemporary), WDST-100.1 (independent rock), WPKF-96.1 (rhythmic top 40) and WVKR-91.3 (Vassar College Radio). AM radio stations in the area are WEOK-AM 1390 (Oldies), WGNY-1220 (sports), WHVW-950 (50's and older blues and country), WKIP-1450 (talk radio). The Hudson Valley Renegades are a minor league baseball team affiliated with the Tampa Bay Rays. The team is a member of the New York–Penn League, and play at Dutchess Stadium in the nearby town of Wappinger. The Hudson Valley Hawks were a team in the National Professional Basketball League until 2009 when the league disbanded. The team's home court was at Beacon High School, in nearby Beacon. The Hudson Valley Highlanders of the North American Football League played their home games at Dietz Stadium in nearby Kingston. Poughkeepsie also hosted a founding member of the North Eastern Hockey League (NEHL) with the formation of the Poughkeepsie Panthers in 2003. However, due to financial problems, the team only played for one season, and became the Connecticut Cougars the following year. The NEHL folded due financial problems in January 2008. Subsequently, the city was home to the Hudson Valley Bears, one of four founding members of the Eastern Professional Hockey League (EPHL), for one season. Both teams played their home games at the McCann Ice Arena in the Mid-Hudson Civic Center. Poughkeepsie often hosts tri-state area laser tag competitions, as referred to regularly in How I Met Your Mother. One of Poughkeepsie's most notable sports events was the annual Poughkeepsie Regatta of the Intercollegiate Rowing Association (IRA), which was held on the Hudson River from 1895 to 1949. The top college teams would attend along with tens of thousands of spectators. Poughkeepsie was known as the rowing capital of the world. Spectators watched from the hills and bluffs overlooking the river and from chartered boats and trains that followed the races along the entire length of the course; which were longer than present-day races, with varsity eights rowing a 4-mile race. When the IRA moved the regatta to other venues, the Mid-Hudson Rowing Association was formed to preserve rowing in the area. It successfully lobbied to preserve the regatta's facilities for use by area high schools and club rowing programs. As part of the 400th anniversary celebration of Henry Hudson's trip up the Hudson River a recreation of the regatta was held with Marist College Crew as its host. The events included a fireworks display, a large dinner and the unveiling of the restored historic Cornell Boathouse, now property of Marist Crew. Historically accurate, the four mile long course started off Rogers Point in Hyde Park and ended about a mile south of the Poughkeepsie-Highland Railroad Bridge. Competitors included Marist, Vassar, Army, Penn, Navy, Syracuse, Columbia and Cornell. Notably this was the first time women's crew teams were allowed to participate in the historic IRA Poughkeepsie Regatta. Established British racing team Carlin Motorsport have chosen Poughkeepsie as their U.S. base whilst racing in Indy Lights. The Bardavon 1869 Opera House. Poughkeepsie has a number of notable institutions for arts and entertainment. 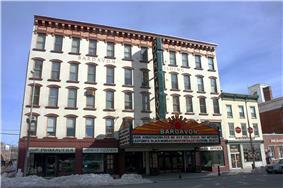 The Bardavon 1869 Opera House, located on Market Street just below Main Street, is a theater which has an array of music, drama, dance and film events. It is also the home of the Hudson Valley Philharmonic. The Mid-Hudson Civic Center, located down the street from the Bardavon 1869 Opera House, hosts concerts, professional wrestling, and trade shows and has an ice rink next door for hockey events. From July 1984 to August 5, 1986 the Civic Center was the location for filming WWF Championship Wrestling, the World Wrestling Federation's nationally and internationally broadcast weekly television program of the time. The Chance, located at 6 Crannell Street in downtown Poughkeepsie, hosts live rock concerts with local as well as major artists. The collections of the Frances Lehman Loeb Art Center at Vassar College chart the history of art from antiquity to the present and comprise over 15,000 works, including paintings, sculptures, drawings, prints, photographs, and glass and ceramic wares. The Barrett Art Center at 55 Noxon Street offers exhibits, classes, lectures, and demonstrations focused on the visual arts. Twice yearly it presents nationally acclaimed shows, juried by curators of notable museums. It had also operated Barrett Clay Works at 485 Main Street, with studio spaces for individual artists, and a street level space devoted to instruction in various methods of "working clay" for children through seniors. Locust Grove, the home of Samuel Morse and a National Historic Landmark, features representative paintings by Morse, as well as historically important examples of telegraph technology. For shopping and movie theater entertainment, the Poughkeepsie Galleria is located in the Town of Poughkeepsie. The mall, which opened in 1987, consists of two floors with 250 shops and restaurants to enjoy. The Regal Cinemas theater has 16 screens. Current anchor stores within the mall include Macy's, J. C. Penney, Target, Best Buy, H&M, and Sears. The Galleria is owned and managed by The Pyramid Companies, a group which manages and owns other sister mall complexes. The Mid-Hudson Children's Museum, located at 75 North Water Street, serves the city and region as an educational resource center, family destination, and tourist attraction. The Cunneen-Hackett Arts Center at 9 and 12 Vassar Street provides venues for both professional and amateur artists to showcase their talent in music, dance, and the visual arts. Bananas Comedy Club is a comedy club that presents comedians such as Jim Norton, Rich Vos, Patrice O'Neal, and Nick DiPaolo. Jimmy Fallon started his career performing at the club. Joseph Bertolozzi's Bridge Music is a sound-art installation on the Mid-Hudson Bridge, allowing listeners to hear it played like a musical instrument. A recording of the results, the 2009 CD "Bridge Music" (on the Delos label DE1045), entered the Billboard Classical Crossover Music Chart at #18, and has been released globally. The Bridge Music Listening Stations (which play selections from the CD) are located on the pedestrian sidewalk of the Mid-Hudson Bridge, at each of the bridge's towers. They are open dawn to dusk from April 1 through October 31. Additionally, Park Radios on 95.3FM play the same music year-round, in Waryas Park, Poughkeepsie and Johnson-Iorio Park, Highland. In 2011 Empire Cruise Lines began the operation of the first dinner and tour boat to call Poughkeepsie homeport in nearly two generations. The M/V Mystère is a 60-foot double decked tour boat which departs from Waryas Park, 29 North Water Street, in the City of Poughkeepsie. Sprout Creek Farm is an educational farm that rents out a cottage for weekend trips. Andrew Jackson Davis (1826–1920), known variously as the "Poughkeepsie Seer" or "The Seer of Poughkeepsie". Mark Parker, President and CEO of Nike, Inc.
^ Buff, Sheila (April 1, 2009). Insider's guide to the Hudson River Valley. Morris Book Publishing, LLC. p. 6. ^ "Transitioning to the New OMB 2013 Metropolitan Area Definitions" (PDF). Federal Housing Finance Agency. p. 25. Retrieved 13 February 2015. ^ "OMB Bulletin No. 13-01" (PDF). 28 February 2013. p. 42. Retrieved 13 February 2015. ^ "Poughkeepsie". Encyclopaedia Britannica Online. Encyclopaedia Britannica Inc. 2012. ^ Crook, Lawrence. "Missing woman's body found 28 years later, behind false wall". CNN. July 2, 2013. Retrieved on July 2, 2013. "The Town of Poughkeepsie surrounds the City of Poughkeepsie in southeastern New York State, about 70 miles north of New York City." 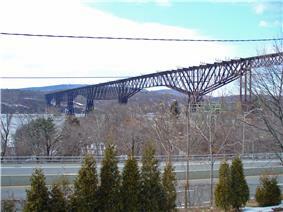 ^ Poughkeepsie Bridge - 'The bridge was Moving'. Catskillarchive.com (2007-07-11). Retrieved on 2014-02-21. ^ "History of Poughkeepsie, New York". December 2014. ^ "Upstate New York events celebrate 400th anniversary of Henry Hudson's voyage up the river". ^ "Regatta Evokes Poughkeepsie’s Rowing Heyday". ^ De La Baume, Maia (5 June 2013). "That Instrument Known as the Eiffel Tower". The New York Times. ^ ["http://josephbertolozzi.com/eiffel-tower-music/" "Joseph Bertolozzi - Eiffel Tower Music"] . ^ Heller, Steven (1999-05-05). "Tibor Kalman obituary". New York Times. Retrieved 2009-10-05. ^ "Rock & Roll Hall of Fame award". Poughkeepsie Journal. 2009-09-23. Archived from the original on August 10, 2014. Retrieved 2009-10-05. Flad, Harvey. 2005. A digital tour of Poughkeepsie. Poughkeepsie, NY: Vassar College. Mano, Jo Margert and Linda Greenow. 2006. 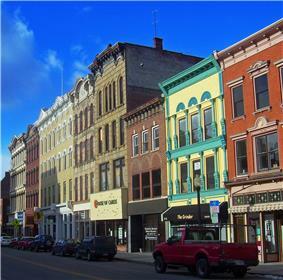 Mexico comes to Main Street: Mexican immigration and urban revitalization in Poughkeepsie, NY. Middle States Geographer 39: 76–83. Gottlock, Barbara and Wesley. 2011. "Lost Amusement Parks of the Hudson Valley". Blurb Publishing: p. 53-78.